SpeedPro Imaging Chicago Loop owner Eric Lazar summed it up perfectly. While the weather was damp Art Basel weekend in Miami Beach, there was no shortage of shine when it came to SpeedPro Imaging and Laurence Gartel’s gleaming creations: three one-of-a-kind Art Cars designed, printed, and featured for the year’s biggest art show. Art Basel Miami Beach is the premier art event in North America. 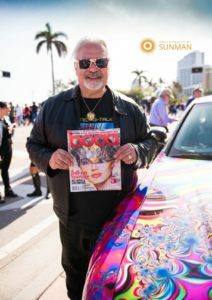 It’s the Super Bowl of the art community and Lazar ensured SpeedPro Imaging, the nation’s leader in large format printing, had a major role in the art world’s annual event. Thousands descended upon Miami Beach for the international art festival during the first weekend of December 2017. From established legends to aspiring young artists, Art Basel Miami Beach is designed to showcase the best of the best in the art industry. 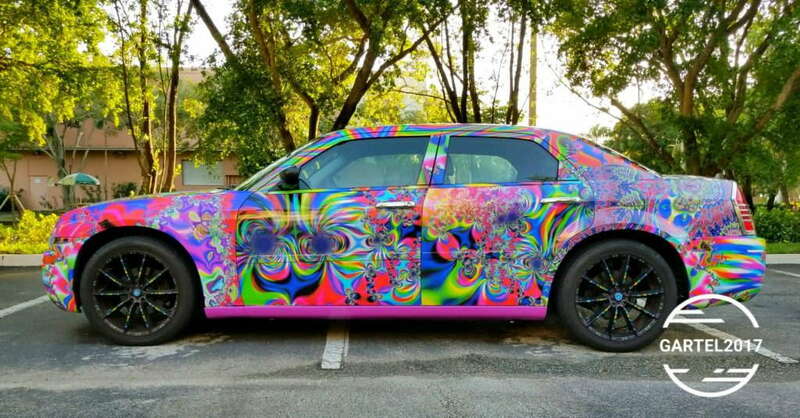 Laurence Gartel, who partnered with Lazar and SpeedPro Imaging for his grandiose Art Cars project, is among the creative elite. Known as the “Father of Digital Art,” Gartel taught Andy Warhol how to use the Amiga Computer, has been featured at the Museum of Modern Art, was the official artist of the 57th Annual GRAMMY Awards, has created artwork for names like Justin Timberlake, the Red Hot Chili Peppers, Coca-Cola, Walt Disney, Gibson Guitars, and holds numerous other accolades. As stated on his website, “Gartel was digital before the PC hit home markets, before Photoshop, before the picture phone or Tablet. Gartel wasn’t only ‘State of the Art’; he virtually pioneered it for Digital Fine Arts.” In other words, no one does digital art like Laurence Gartel. 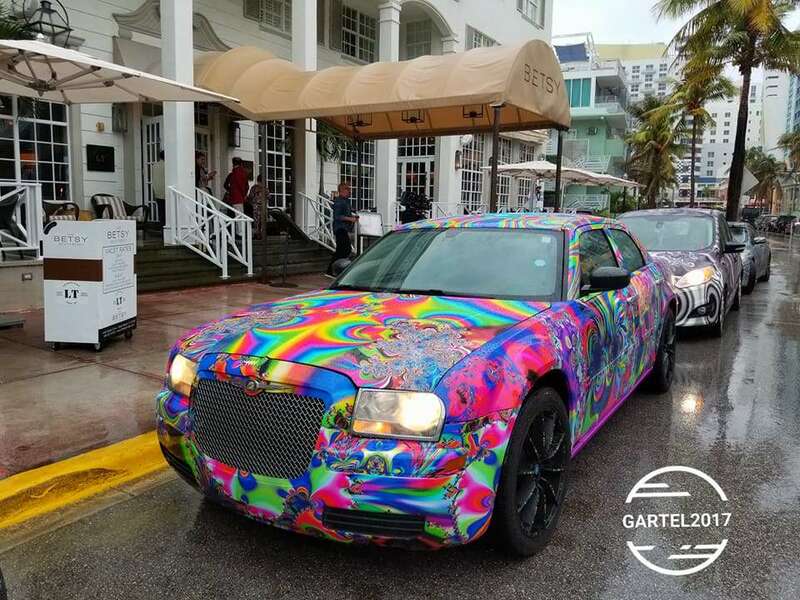 Connecting over a familial link (Gartel was a camper of Lazar’s father back in the 60s), Gartel and Lazar teamed up to produce three custom-made Art Cars for Art Basel Miami Beach. 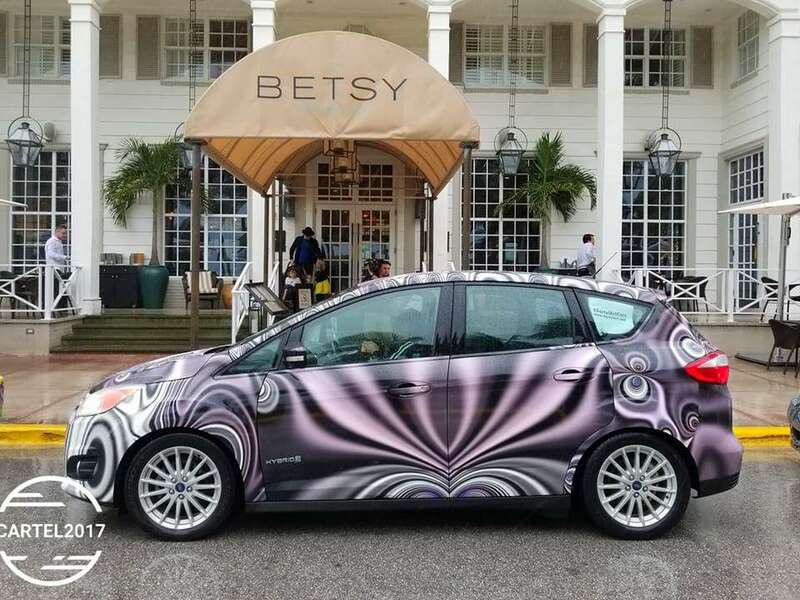 Gartel designed the masterpieces with his one-of-a-kind computer program, then Lazar printed the designs and installed them with the help of colleague Anita Pickens‘ (SpeedPro Imaging Ft. Lauderdale) vehicle wrap bay. The team effort was pulled off in a matter of a few short weeks, making the most of a “go big or go home” moment. 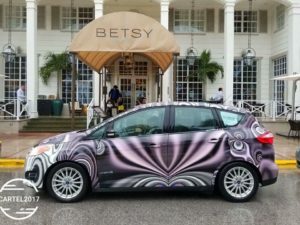 Lazar was tasked with transforming Gartel’s vision into these showstoppers – a psychedelic Chrysler 300, a digital inspired Infiniti G37 and a trippy, purple spiral fashioned Ford C-Max Hybrid. 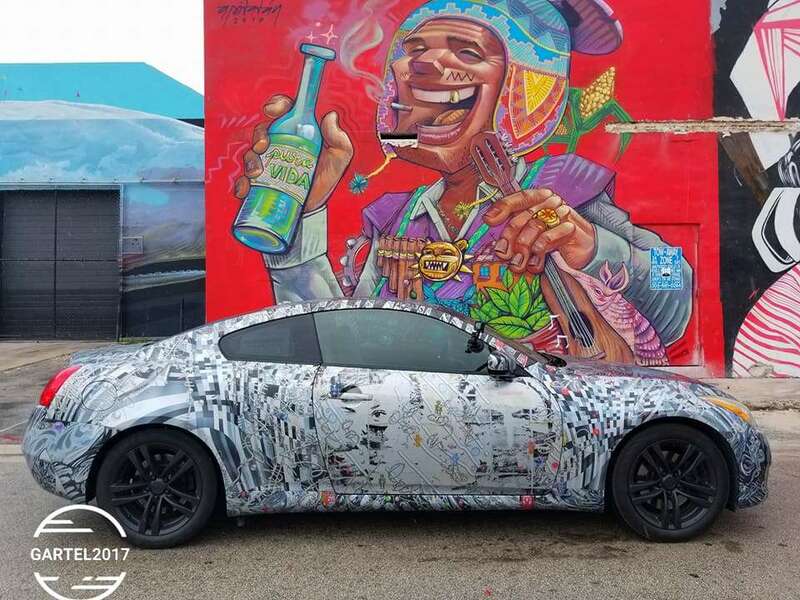 See more of Lazar and Gartel’s Art Basel Miami Beach creations with this behind-the-scenes video. You can get a better sense of Gartel’s thought process and the high-tech, high-quality equipment that Lazar and other SpeedPro franchise owners use to turn their projects into works of art. Eric Lazar’s passion and hard work is reflective of the culture that makes SpeedPro Imaging the nation’s leading printing and graphics franchise. We think BIG at SpeedPro Imaging. That’s why we’re uniquely positioned to be the premier resource for big names and bigger events – from festivals and conventions, to award shows, celebrity functions and more. At SpeedPro, we marry our high standards with your thoughts, goals, and needs to bring your vision to life. There’s a reason our franchise locations are called “studios” – because, within each, we create masterpieces. 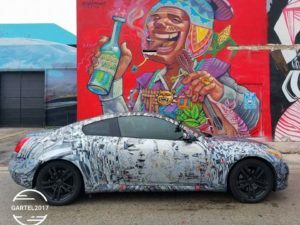 You’ve seen what SpeedPro Imaging Chicago Loop owner Eric Lazar did for world-renowned artist Laurence Gartel. SpeedPro Imaging is willing and ready to do the same for your dream. You can find our full list of products and services – and solutions for your specific company and/or industry – when you visit speedpro.com, send us an email or call us at (844) 274-4784.